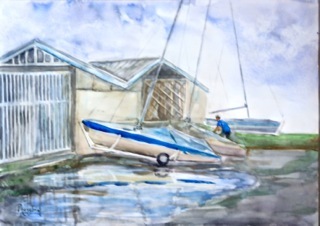 En Plein Aire painting at the Royal Akarana Boat Club is always technically challenging. There are so much to choose. To keep going at painting art, I have to find varieties to stretch boundaries. That is probably the reason I feel excited at the opportunity. This time I chose the close view of the boat yard. Gazing, drawing, painting in a nice day with fine weather on the seaside like this is very hard because on the other side of me is just wanting to sit on a comfortable chair with a drink and a view. I kept on regardless. It was hard work but I felt happy that I had tried! A little persistence and discipline can go a long way!